Hello. 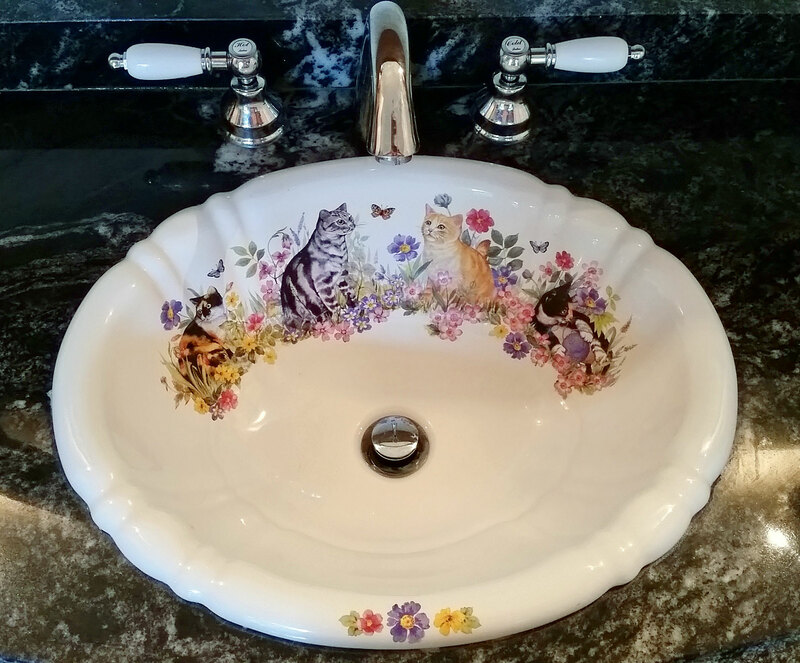 It’s another customer bathroom with a beautiful bathroom featuring the Cats in the Garden painted sink. It’s a popular design for a cat-lady, cat-man or cat-family, obviously! It’s got four beautifully painted cats on the sink, frolicking in the garden with pretty flowers and watching… waiting to attack the butterflies. It’s full of great colors and your bathroom decor can be easily coordinated with it. Green, blue, beige, pink, gray, black, yellow, this design had pretty much every color in the spectrum. Let’s get started with the actual sink so you can see what I’m talking about! 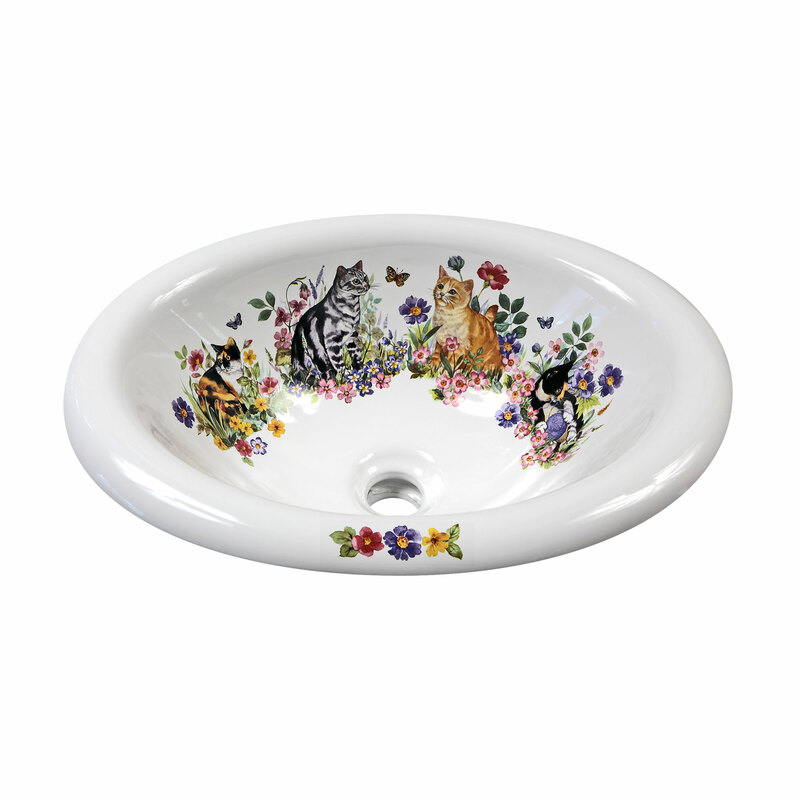 It’s just one of the animal-inspired painted sinks available on the website, decoratedbathroom.com. Cats in the Garden painted on a biscuit drop-in sink. It’s shown above on a nice little biscuit sink, about 17 x 15″ with a big rolled rim. It’s a design painted with flowers, leaves, grasses, butterflies and especially… cats, one even has a ball of blue yarn. If I was a cat-lady, I would know them, my sister is a big cat-lady. I am a dog-person. She has about 5 in the house and feeds several in her backyard. Busy lady. Me? I have a senior dog, I hope for at least another year. He is a 70 pound (was closer to 85) Labradoodle named Bentley, a very nice boy and going strong at 16 and 1/2 in another 9 days. I just got his blood done at the vet… perfect. Back to the sink… you can check it out on the website here, Cats in the Garden Drop-in Sink. That’s the same sink and same design, this time in white and a way better photo! You can buy in on our website here. Not the best photo but a very nice bathroom indeed. The bathroom is in Ontario, Canada, my homeland and the place I want to be when it’s summer in Las Vegas. t looks like a nice, old, Victorian farmhouse. There are many of them in Ontario, so beautiful. 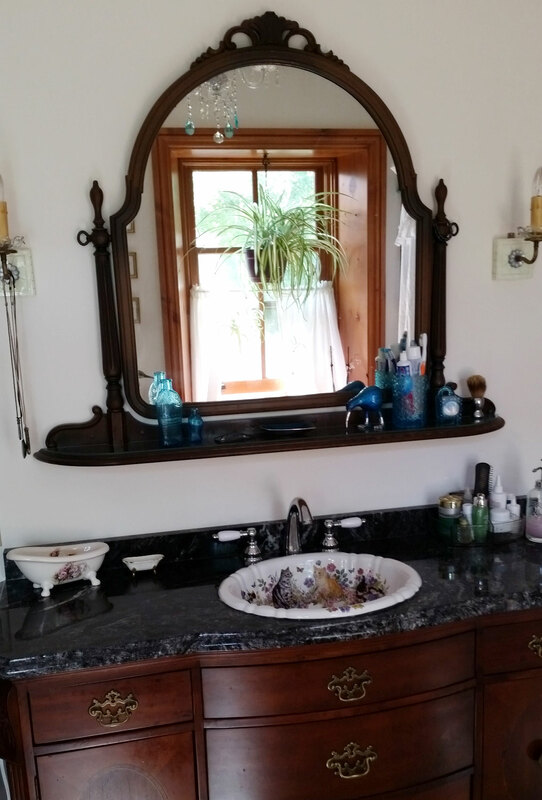 The vanity definitely looks like an antique dresser and the mirror with a shelf, hanging on those side bits reminds me exactly of a mirror we had in our farmhouse in the countryside in Ontario when I was growing up. Oh to be there now. They must like cats, cause they got them on the sink. Close up of the Cats in the Garden design on a white Bates & Bates Georgia drop-in basin. 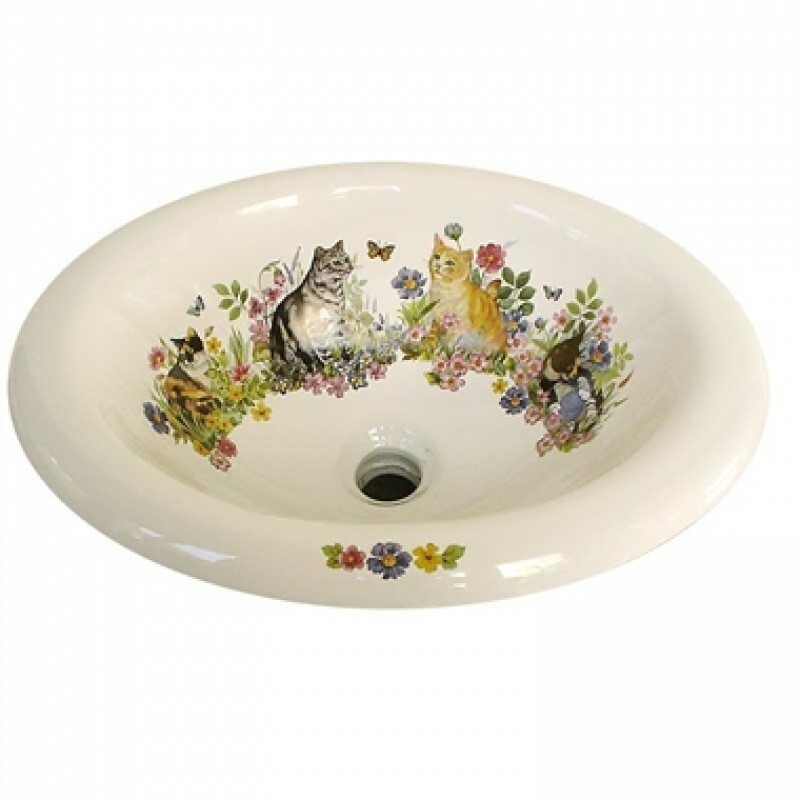 The Cats in the Garden design works really well painted on this fluted basin and takes the decorative aspect of the sink to a new level. The style of the sink also goes great with the style of the vanity with it’s fluted front. The best thing about this sink is the fixture is actually made in Oxnard, California and then I decorate them in Henderson, Nevada. NAFTA friendly, I hope that part lasts. I sell quite a few sinks in Canada. It also looks great on any of our accessories, featured in a previous post here.